This page provides you with Public Relations resume samples that you can use for inspiration in writing your own resume, or for creating one through our easy-to-use resume builder. Below you'll find our how-to section that will guide you through each section of a Public relations resume. It’s hard to think of a more difficult and competitive industry than Public Relations. Everyone thinks this is all about getting invited to fancy events, meeting cool people or having the time of your life: you very well know what the real meaning of your profession is. Public relations experts are integral to controlling and maintaining a healthy relationship between a business and the public. Careers in public relations will typically involve interactions with consumers, social media management, and training staff to stay on message, all in service of promoting a particular image of the brand. The aim is to educate not only customers but staff, investors, and stakeholders. Competition for this sector is fierce, and that’s why you need to have access to the best Public Relations resume sample to inspire you. Well, my friend, look no further! We have helped thousands of excellent and successful professionals like you get the job they have always dreamt of. Just sit down, relax and get ready for the journey! 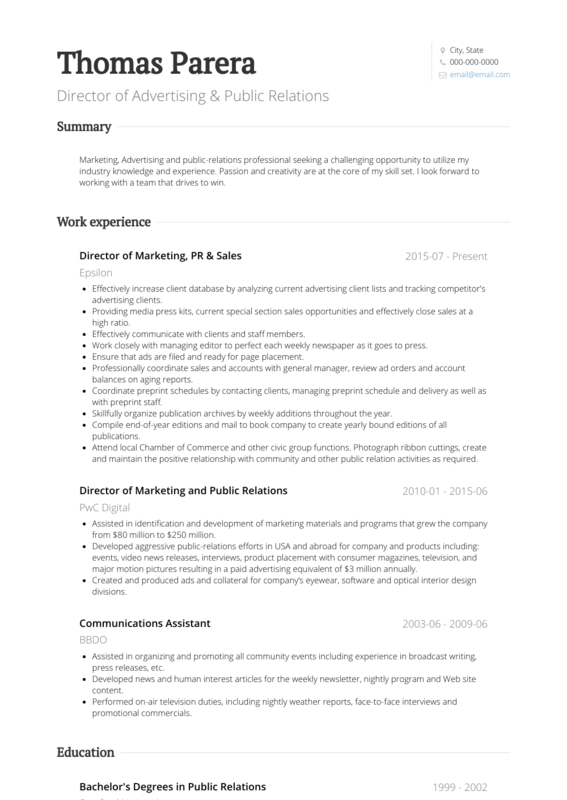 How to Write a Public Relations Resume? As this is a career that requires excellent communication skills, be clear and concise when writing your resume. Use a resume template that allows you to showcase your experience and skills: we strongly suggest the reverse chronological format for your public relations resume. Your future employer will thank you as it includes all the most important details of your professional journey and makes your selling points very clear to the recruiters! If you recently graduated or you are an entry-level candidate, put your education section above your work experience. Make sure you include any academic projects or courses you have been part of. Include concrete examples of projects you have contributed to as often as possible. A degree in communications or something similar is often required for public relations jobs, so prominently feature your education. Last but not least: don’t forget to save your Public Relations resume as a .pdf file. As good as Microsoft Word is, it unfortunately does not keep your layout intact. Pretend you are better than the recruiter. Your work experience section is the most important part of your resume. This is where you describe roles that you have held previously, beginning with your most recent position at the top of your resume and working backwards. Your work experience can’t just be a boring list of responsibilities, however. You need to show that you are a public relations expert and really sell your skills and abilities. You can do this by focusing on your most significant accomplishments in previous roles, the situations where you really made a difference for your clients. Showcase your most marketable skills, and use measurable achievements whenever possible. Keep it short: 1 or 2 pages, please! Finally, if you are looking for the best Public Relations resume templates, you should check this masterpiece we have been working on here : many professionals like you have successfully used it to take their career to the next level.